Gardaí said that the incident happened just after 9.30am this morning. The scene at Coolmine today. 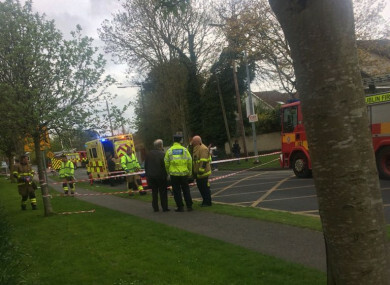 A TEENAGER IS in a critical condition following a hit-and-run in Blanchardstown this morning. The incident occurred around 9.30am this morning near Coolmine train station. Two men aged 54 and 19 were seriously injured when they were struck by a car. A female pedestrian also sustained minor injuries. The two men were taken by ambulance to Connolly Hospital, where both are in what is described as a serious condition. The teenager’s condition is understood to be critical. The driver of the car failed to remain at the scene. During a follow-up operation gardaí arrested a man in his late 30s a short time later. He is currently detained for questioning in relation to the incident under Section 4 of the Criminal Justice Act, 1984 at Blanchardstown Garda Station. The road is currently closed for technical examination and local diversions are in place. Garda Forensic Collision Investigators have been requested to examine the scene, but rail services at Coolmine Station are not affected. Anyone with information is asked to contact Blanchardstown Garda Station 01-6667000 or the Garda Confidential Line 1800 666 111. Email “Teenager in critical condition after morning hit-and-run in Blanchardstown”. Feedback on “Teenager in critical condition after morning hit-and-run in Blanchardstown”.